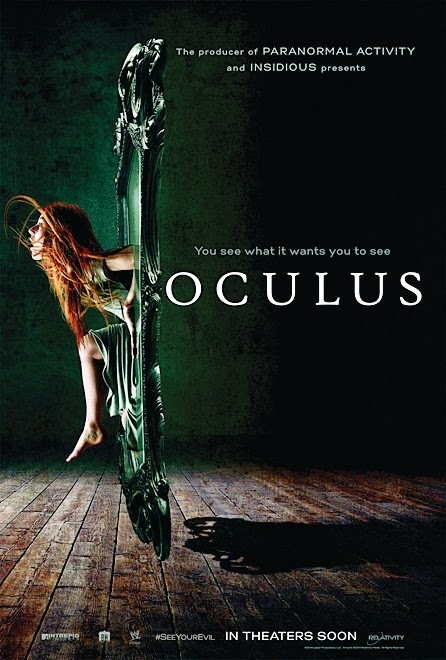 Oculus, the first real horror movie of the year. This one was a surprise to be quite frank, for after seeing its advertisements, I was not completely sold on the fact that this would be a film to hold much discussion. Though I was pleasantly wrong. So Oculus, a film that does not hold many notable names, but names that were filled with talent. Our story goes as follows: Two siblings--a brother and sister--reunite ten years after a tragic paranormal incident that occurred within their childhoods. This entity resides in a Victorian-esque mirror that hung inside their old home that absolutely drove their family mad; now it must be stopped once more. The plot here is intricately designed and ever flowing and I've kept things brief about it for the mere fact that the film should be kept mysterious. I was genuinely impressed and interested with each act of the film and I felt as if the writing swiftly carried us viewers along in its well-timed thrill ride. The story travels in and out of present and past, reflecting both on these two siblings as children and adults in their present state and this greatly improved its pace and oddly enough reminding me of a tale you might find in The Twilight Zone. The characters were very real and likeable, though overdone in brief moments, and their actor counterparts felt authentic and very much "in" their roles. The mirror is even a mention worthy character in itself. All in all, the movie was far more interesting than scary and that is perfectly fine, although it did have me tightening the drawstrings on my hood a time or two during the film's final act. This is a movie that should be seen and not overlooked, do not be deceived in thinking this is just another slasher-flick, instead, take a look into the mirror and see it for yourself.